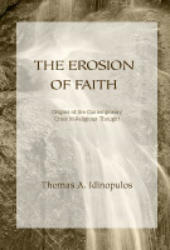 Title: The Erosion of Faith: Origins of the Contemporary Crisis in Religious Thought Author: Thomas A. Idinopulos Philosophical and Cultural Studies in Religion Imprint: The Davies Group, Publishers soft cover 278 pp. USD 24.00 ISBN 978-1888570670 November 2005 The Erosion of Faith is a unique exploration of the ideas of the great theologians of the last 150 years, whose works form the background for all serious contemporary discussions of religion. The objective of this remarkable synthesis by Thomas Idinopulos is to discover the origins of those theological ideas that have led to both a human loss of faith and to the revolutionary ferment within virtually all modern organized religion. The subjects of his inquiry are Friedrich Schleiermacher, Søren Kierkegaard, Karl Barth, Paul Tillich, Jacques Maritain, Nicolas Berdyaev, Martin Buber, and the newer secular theologians, especially Dietrich Bonhoeffer, Harvey Cox, Thomas J. J. Altizer, and Richard Rubenstein. Theologians from Schleiermacher to Cox have agreed that the problem of God is linked to the problem of modern human beings. The loss of certainty about God, church, and Bible reflects loss of confidence in humanity. It is not a loss of confidence in science or technological powers, as Mr. Idinopulos explains, but rather a loss of a sense of personal dignity, and a sureness of human destiny. In the minds of theologians, the loss of certainty about God means that men and women have lost the sense of ultimacy that gives depth and purpose to everyday life. The great achievement of Mr. Idinopulos is to show how the general trend in theology from Schleiermacher to the present-day has been away from church and Bible and toward cultural experience as the resource for mankind’s understanding of the human relation to God. Thus, modern theology has reintroduced the questions of humanity itself: questions of life and death, experiences of tragedy, joy, and guilt, of rejection and acceptance, of loss and love. Contents Preface Chapter 1 The Theology of Feeling: Frederich Schleiermacher Chapter 2 The Theology of the Individual: Søren Kierkegaard Chapter 3 The Theology of the Word: Karl Barth Chapter 4 The Theology of Correlation: Paul Tillich Chapter 5 Theocentric Humanism: The Thomistic Philosophy of Jacques Maritain Chapter 6 The Theology of Godmanhood: Nicolas Berdyaev Chapter 7 The Theology of Dialogue: Martin Buber Chapter 8 Theologians in a World Come of Age Notes Selected Bibliography Index Author Thomas A. Idinopulos taught in the Religious Studies Department at Miami University in Oxford, Ohio. His writings have appeared in several magazines and journals including Encounter and the Journal of Religion. He is the best-selling author of such works as Weathered By Miracles, What Is Religion? and Religion and Reductionism.